Avimimus skull. Avimimus portentosus. A diminutive 5-ft dinosaur with ostrich-like features in part. Late Cretaceous Gobi Desert. 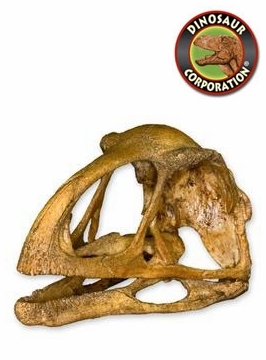 * Avimimus skull is museum quality fossil replica, cast in durable polyurethane resins. Avimimus was a genus of birdlike dinosaur that lived in the late Cretaceous in what is now Mongolia, around 75 million years ago. Avimimus was a small dinosaur, standing about 2.5 feet tall at the hips and a length of 1.5m (5ft). The skull was relatively small compared to the body, though the eyes and brain were relatively large. As in the related Oviraptoridae and Caenagnathidae, the jaws of Avimimus formed a parrot-like beak, and lacked teeth. However, a series of toothlike projections along the tip of the premaxilla would have given the beak a serrated edge. The neck was long and slender; the neck vertebrae are much more elongate than in other oviraptorosaurs. It also had three-toed feet with narrow pointed claws. Little is known of the tail but the hip suggests that the tail was long. Unlike oviraptorids and caenagnathids, the back vertebrae lack openings for air sacks, suggesting that Avimimus is more primitive than these animals. The forelimbs were relatively short. The bones of the hand were fused together, as in modern birds, and a ridge on the ulna was interpreted as an attachment point for feathers by Kurzanov. The ilium was almost horizontally oriented, resulting in exceptionally broad hips. The legs were extremely long and slender, suggesting that Avimimus was a highly specialized runner.